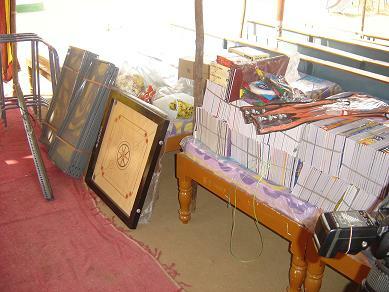 Bighelp provided Notebooks, Walking aids, Sport articles and infrastructure facilities such as wooden cots, beds, class room benches, steel rack, steel book rack with glass doors, note books and sports material to Shekinah Foundation which is providing free education, food, accommodation and health care to children with physical challenges. 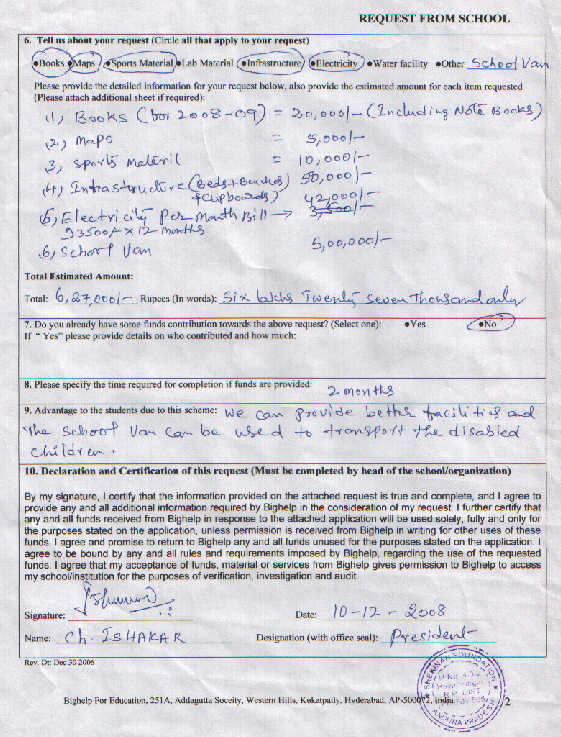 Part of the donations for this project were raised by Ã‚â€œIndia Employee Network (IEN)Ã‚â€ at State Street Corporation (Boston, USA) by organizing Corporate Cricket League in July/August 2008. This is the second project implemented using the funds raised through the Corporate Cricket League. The balance funds were raised from individual donors and emolyee matching gift programs to support this project. 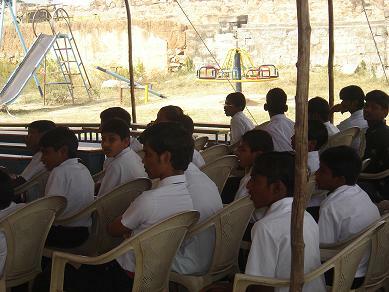 Shekinah Foundation for the special needs children is established in 1992 at Hayathnagar Mandal of Ranga Reddy district, AP, India. 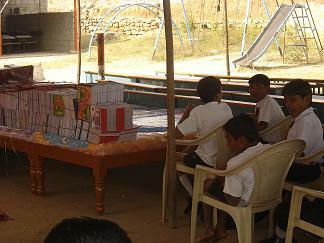 The foundation is running a school for the children from 1st to 10th class. About 150 special needs and orphan children getting quality education with the support of trained, experienced and dedicated teaching and non teaching staff. 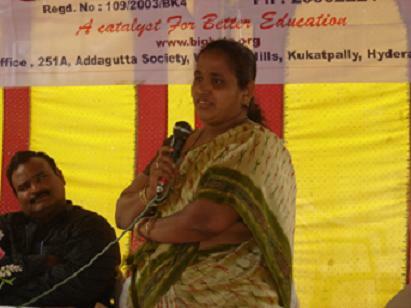 This school is run and managed by a professionally qualified physically challenged person and a dedicated team of experts is the first of its kind in the state of Andhra Pradesh. 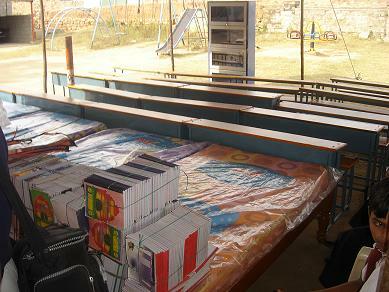 It provides free education, free food, free accommodation and health care to children with physical challenges. 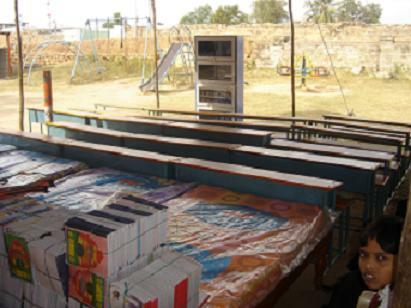 Under this project, Bighelp provided infrastructure facilities such as 5 wooden cots, 5 beds (4 inches thick), 10 class room benches small size, 10 class room benches big size, 1 steel rack,1 steel book rack with glass doors, 4 walking aids, note books and sports material. 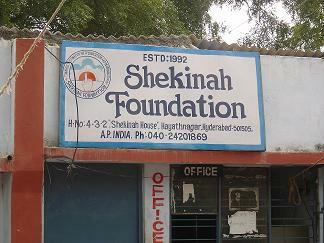 Shekinah Foundation for special needs is situated in Hayathnagar Mandal, Ranga Reddy District, AP, India. 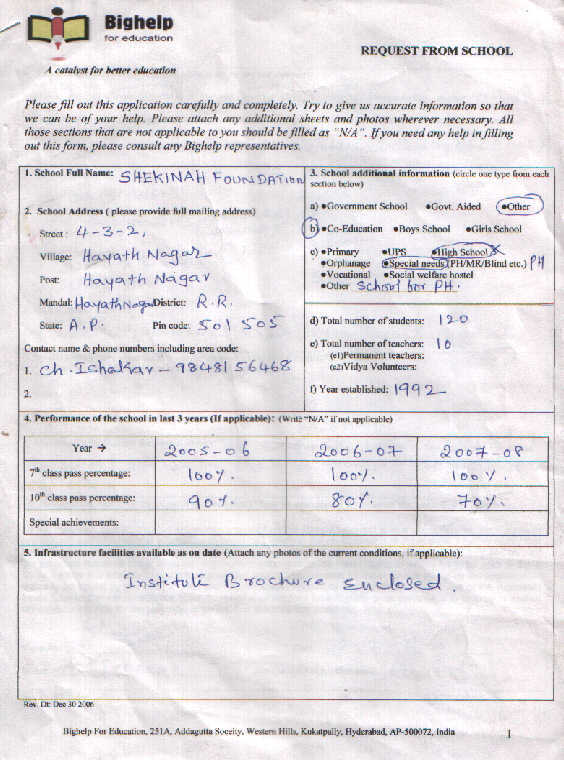 In the same compound of the Foundation Ã‚â€œShekinah Residential School for DisabledÃ‚â€ is being run by foundation by appointing teachers on the salary basis. 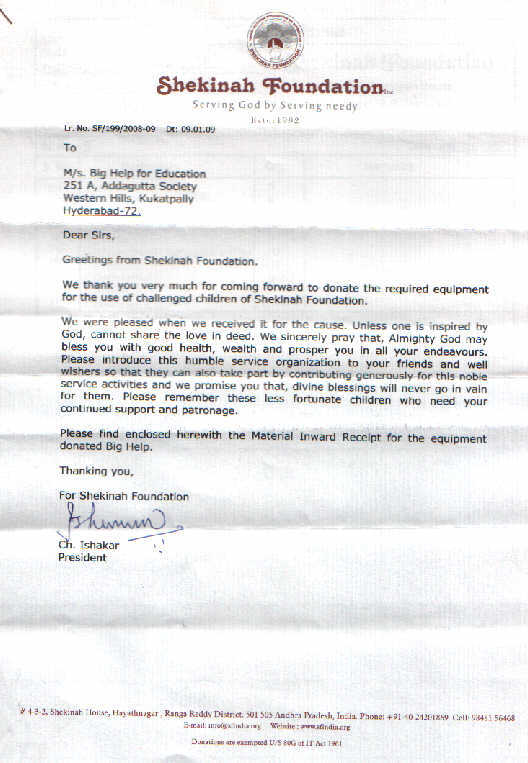 Shekinah Foundation is a registered, non profit, non Ã‚â€“ commercial Voluntary organization dedicated to serve humanity without distinctions of religion, caste, creed or region, established in 1992 in Hyderabad. 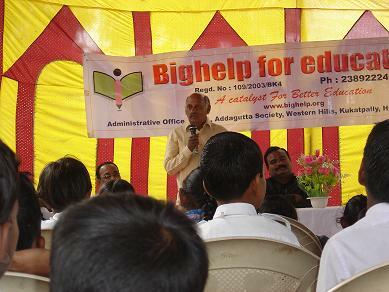 At present it caters to educational needs of about 150 children from the underprivileged back grounds. 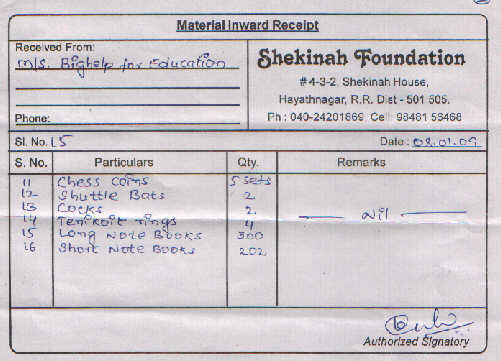 This project was implemented by Bighelp on 08-Jan-2009 at the premises of Shekinah Foundation and donated the items to the students and the school. A brief meeting was conducted and dignitaries have spoken along with AED (A) who narrated Bighelp activities and appreciated the efforts of the Shekinah Foundation working for the physically handicapped children from underprivileged background for the last 15 years. Bighelp team thanked Ã‚â€œIndia Employee Network (IEN)Ã‚â€ for organizing the fundraising event for Bighelp through Corporate Cricket League and thanked State Street, Oracle, Wipro & Syntel for sponsoring the event and helping the special needs children. 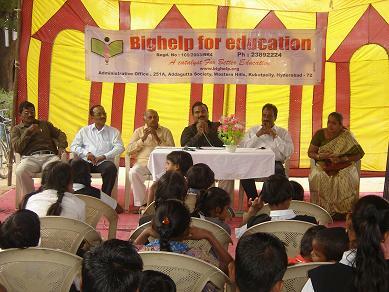 The infrastructure material is presented to Foundation by Bighelp Executive Directors Sri S.Seshagiri Rao & Sri R.Jawaharlal. 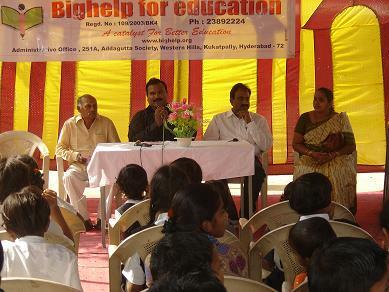 The program was concluded with vote of thanks by Mr.Tirupati Reddy a Social worker and volunteer of Shekinah Foundation. 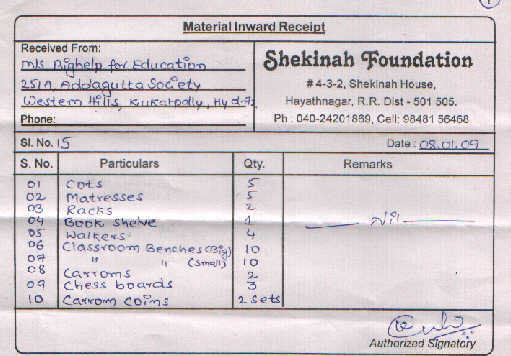 Shekinah Foundation is one of the 4 institutions surveyed by Bighelp for providing education & support for physically and mentally challenged children. Bighelp supporters Mr. & Mrs. Shaik Saida referred Shekinah Foundation to Bighelp and helped Bighelp team to establish communication with this organization. 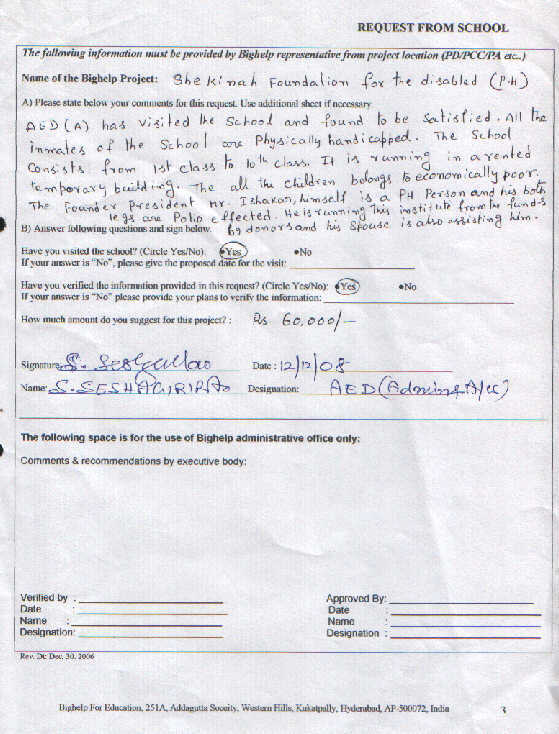 Mr. Seshagiri Rao (Asst. 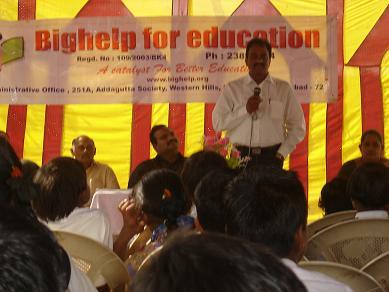 Exec Director) from Bighelp visited this school twice, verified the need for the support and collected the requirements. 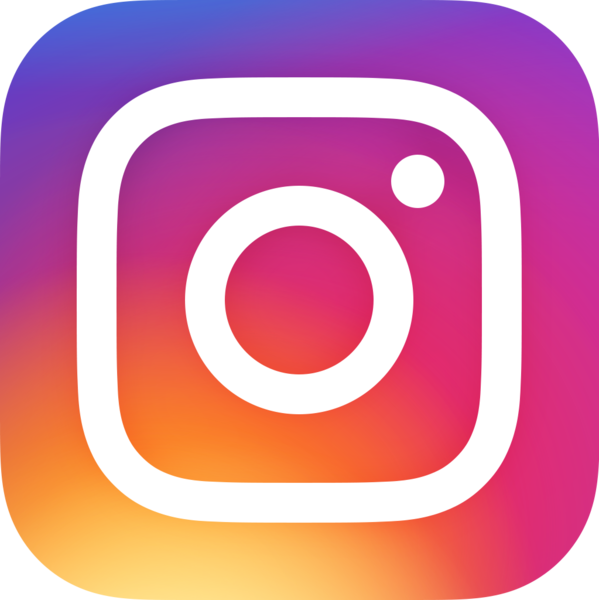 Shekinah is registered in 1992 in Hyderabad, AP, India. 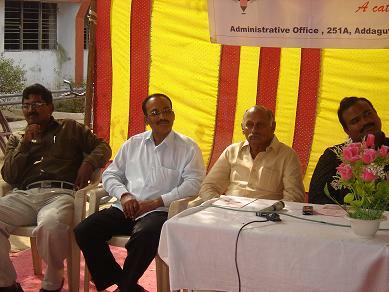 It is established in rented building and running the foundation by seeking donations from donors. The Founder of this Foundation Mr.Ishakar is a physically handicapped person (Polio affected) and a Post graduate in Master of Arts & Sociology devoted to the cause of serving the disabled and the poor.